**Robyn's Note** This is a cross post. I put it as my "Tips on Tuesday" at my other blog, but chose to expand it a little more here since my original thought was to make this a 2E post instead of a Tips. I live an interesting life. Through the years, I've learned that people think I'm very organized. My family would be quick to say I'm not organized...most of the time. I have a real Type A-B personality. Having Twice Exceptional children, I'm learning that I probably contribute to their quirkiness. I'm organized in the things that matter to me. Other areas that I don't care about, like desks, closets, etc., are a barren wasteland of mess and chaos. I'm going to interject something here--one of the things I've learned about 2E kids is that they have a terrible time with organization. (And I thought it was just a poor example from their mother.) Since they often have a hard time classifying and grouping things the way 'normal' children do, they can't keep things organized. While we might put all the legos into one bin, all toy cars and trucks and motorcycles into another bin, etc. ; our children may have a different way that works better for them. Maybe the legos (except not the red ones) go into one bin. The red ones go into a bin with the toy firetruck, the red toy cars and the red power ranger (red things), cars and trucks go in one bin, but motorcycles need a different bin because two wheeled vehicles don't go with four wheeled vehicles. What an ah-ha moment for me. When I let my kids sort and classify according to what makes sense to them, it's easier for them to be organized. Just because I want to sort by size doesn't mean my system will work for them. And, for those who can't grasp their concept of organizing, take a photo after they sort their things into the way they want it. Print and tape the photo onto the bin. Even if I never figure out their system, the fact that they created it for their brains lets them control it. Once I realized how important looking at things in a different light is, I realized why the following tip has worked so well in our home. Several years ago, I read about an organizing idea that really helped me personally. The kids kept wearing the same 4-5 shirts over and over. They would pass up their favorite shirts and I couldn't figure out why. When I realized they only took the top shirt out of the drawer, they were only looking at two choices each day. They wouldn't lift one to look underneath it to find their favorite. I decided to try the idea I read about and it's been so amazing we've never gone back. I had to learn to fold shirts slightly differently because the drawer is longer (front to back) than it is deep. 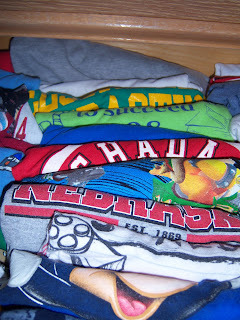 Instead of folding shirts in half, I now fold them into thirds and put them in the dresser drawers like file folders. Now, anyone who opens the drawer has a quick shot of all their shirts. You can see part of the design and it makes it fast and easy to find the exact shirt you are looking for. 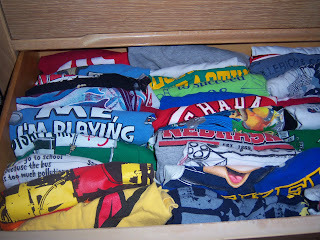 Want the Mickey Mouse shirt, try the 2nd row at the "bottom" of the drawer. Want your favorite shirt about playing video games, it's the blue one in the first row, middle. It's made it a lot easier for my children to be independent and dress themselves while also giving them decision making opportunities. (Keeping in mind that Nathan, my strongest 2e, has a terrible time making decisions. He's afraid his choice will ruin the whole enchilada for everyone else. But since these are his clothes and he can only ruin his own day, he's learned to pick from the drawer on his own.) An added benefit is the shirts take up less room this way so I've been known to use the rest of the drawer to store shorts in the summer or pants in the winter. What organizational ideas work for you? Since I only fool the rest of you into thinking I'm organized, I would love some additional ideas. Also, have you found organizational tips that work for your 2e? We're always looking for help in this area.